The 10th Annual “Cigars for Troops” drive is underway. This is a great opportunity to give back to those who protect our freedoms and earn the coveted "Troop Supporter" badge at the same time. 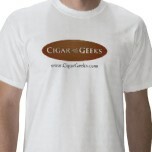 You can find information here: http://www.cigargeeks.com/community/forums/thread-view.asp?tid=5087... A special thanks goes out to Nathan (nwb) for running the drive again. The points contest is under way for the month of March. The 26 members with the most points for the month have a chance to win a $25 gift certificate to Famous Smoke Shop. You can read the details HERE. To view the previous month's contest results see here. This one had a smooth, slightly oily wrapper with a couple of minor veins. Gave it a punch and PLD was good. Got an easy draw, good smoke volume, with the burn starting slightly wavy. Flavor is mild and pleasant with a slight hint of cream. Typical profile for Conny-wrappered sticks in my experience. The burn evened out in the first inch and remained that way through the course of the smoke. The ash dropped at about 1 1/2" leaving a nice cone. From there things were uneventful down to the nub apart from me pulling a stem out of the punch hole in the last third after feeling a slight protrusion against my lip. Another shoddily made Honduran Gurkha, why am I not surprised. Pleasant enough flavors, which means the other two I have will make decent commute smokes, but I won't be buying more of these. Have had mixed results with various Diesels up to now, so had no idea what to expect from this stick. The appearance was promising, though, with its dark, oily, relatively vein-free wrapper. It also had a firm feel, indicating a tight pack. Punched it and PLD was good. The light gave an easy draw, good smoke volume, and an even burn to start things off. The ash was very fine and the first chunk was knocked off at close to 3", which left a nice cone. Things were then very uneventful down to the 1/2" nub. Had this one sitting around for quite awhile taking up space in one of my jars, so decided it was time for it to go. Had previously smoked the Toro version of this blend and didn't have particularly good luck with its performance, so wasn't expecting much from this one. Punched it and PLD was good. The light produced an easy draw, good smoke volume, and an even burn to start. Flavor was in the medium range with a slight hint of cocoa, kind of similar to the La Perla Habana Black Pearl Morado I had yesterday. . Not much else going on apart from being pleasantly puffable. I see from my review of the Toro that I found nuts and hay in that one, but didn't get either of those with this one. Knocked the fine grey ash off at about 2 1/2" and this left a nice cone. From there, things were uneventful down to the nub apart from the cocoa changing to a slightly bitter dark chocolate in the last third. This one almost reaches four stars as the construction and performance were the best I've seen from a Gurkha so far. Razor sharp burn and great draw all the way through. The only thing holding this one back is the relative lack of interesting flavor, otherwise it was a great smoke. It may be well constructed and it may burn well, but this stick was just far too bitter to enjoy properly or to pick up any flavors worth mentioning. Although I have had some Macanudos that have been okay, this was not one of them. Round two of the smoke-fest this evening with Ozz and I wanted a longer smoke to keep me company while we watched Frodo and friends in Lord of the Rings. They don't make them much longer than this one, so it was an obvious choice. Good looking stick with a smooth, dark, oily wrapper and nearly vein-free. Gave it a punch and this resulted in the wrapper cracking a bit at the head. PLD was a bit tight, and the light confirmed this with a tight draw and meager smoke volume. The burn was even to start. Gave it a straight cut with the guillotine shortly after initial light to see if this would improve the draw, but it did not. Flavors are milder than what you might expect from a stick with such a dark wrapper. Was getting a bit of spice on retro along with a buttery after-taste. Pretty much what I remembered from the Robusto version of this blend. Pleasant enough, but not really in my wheelhouse, and I definitely prefer RB's Genesis The Project blend to this one. Knocked the fine white ash off at 1 1/2" and this left a nice cone. The draw and smoke volume improved to nearly optimal at about the half-way point of the smoke. From there things were uneventful down to the nub. Pretty nice smoke overall, especially in the 2nd half, but not one I'll probably buy more of as the flavors are just not that interesting and I'm guessing the length may have something to do with the deficient draw in the first half. I have three more of these, though, and will update this review if those perform any differently. Ozz came by this afternoon for a smoke-fest, so I grabbed this one out of the humi for the first round. Had only tried one LPH stick prior, that being the 1515 Robusto, and it was a disappointing smoke to say the least, so was hopeful the rest of their sticks were somewhat better. This one is a hefty beast with a good solid feel, and smooth, slightly oily wrapper with minimal veinage. Punched it and PLD was good. Got an easy draw, good smoke volume, and even burn to start. Flavor is medium-bodied with a hint of cocoa and this stayed consistent through the course of the smoke. Not the most interesting profile, but very pleasant for what it was. Knocked the fine white ash off at 2 1/2" leaving a cone and from there things were uneventful down to the nub. Very nice smoke overall - good construction, pleasant flavor, no complaints here. This was a really beautiful cigar. Perfectly constructed and the wrapper was flawless. PLD was somewhat like cedar, chocolate and a little spice. The flavor profile changed from chocolate and sweet to spicy/peppery during the last third. Draw was almost perfect and ash was sturdy, only falling off during the final third. An amazing smoke which I will have to add to the collection! Had only tried the Connecticut blend from this brand so it was time to check out Camacho's other offerings. Wrapper was a bit veiny and somewhat soft to the touch. Flavor profile was in the full range with sweet and spicy notes and a hint of dark chocolate. Very nice and this stayed consistent through the course of the smoke. Knocked the fine grey ash off at 1 1/2" and this left a nice cone. From there, things were uneventful down to the nub with no construction or burn issues to speak of. Definitely leaning towards the full end, strength-wise, as I was feeling the nic. kick towards the last third. Very nice smoke overall - good construction, nice flavors, what's not to like. I'll be picking up more of these as they will make nice commute smokes. Had previously smoked a couple of other vitolas from this blend and didn't have good luck with them, mostly due to their performance, so didn't have high hopes for this one. It's got a soft feel to the touch, indicating a loose pack. Gave it a punch and PLD was on the tight side. The light produced a somewhat tight draw and thin smoke volume at the start. The burn started even but got wavy within the first half inch. The draw and smoke volume both improved about 1 inch in to the smoke making this a much more enjoyable experience. Not what I consider optimal, but it was adequate. Knocked the fine, grey ash off at 2 1/2" and this left a small cone. Following this, the burn almost completely evened out, which was a surprise as I expected it to be a ragged burn all the way through, similar to the other vitolas I've smoked from this blend. Had to give it a touch-up in the last third, but it was after I stuck it with my corn skewer, so I'm not deducting points. The CG iPhone and Android apps are both here now! Is it Mold or Plume?